JTK-94 features a robust set of "larger tools". Ideal for servicing remote sites or mechanical work. Because of the high weight factor of this kit - 54 pounds - a Roto-Rugged™ heavy-duty wheeled case is used. This case features a rotationally molded polyethylene shell, four ball-bearing recessed rubber wheels, locking telescopes handle that extends to 41" and steel curb/stair skids on bottom. This is one rugged kit. Choose between case hardware. JTK-94WW has locking "flip" latches, padded handle and combination lock (pictured above). JTK-94WD has military style 1/4-turn latches, spring loaded handle and padlock hasp, does not include combination lock. The JTK-94WD case is also 2" deeper providing additional storage space. 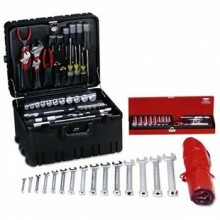 These tool kits measure 17-3/4" X 14-1/2" inside. Hex key set, fold-up (8): 3/32-1/4"
Socket set, 3/8" drive (23): 3/8-7/8" regular and deep sockets, 3/8" drive ratchet, 3" and 6" extensions, 3/8"
3/16 x 3, 1/4 x 1-1/2"
Wrench adjustable (3): 6", 8", 10"
Click the button below to add the Jensen Tools JTK-94WW Deluxe Industrial Tool Kit in Roto Rugged Wheeled Case to your wish list.